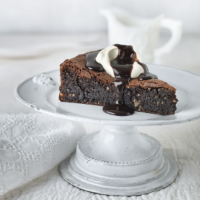 This is a dense, rich cake with just a hint of roasted hazelnut flavour. Don’t worry if it sinks a little in the centre as it comes out of the oven. It’s best served with a glug of chocolate sauce (see separate recipe) and a dollop of whipped cream. 1. Preheat the oven to 180˚C, gas mark 4. Grease a 23cm cake tin and line with baking parchment. Put the hazelnuts in a roasting tray and roast for 10 minutes until golden. Set aside and, once cool, blitz in a food processor with 25g sugar until finely ground. Meanwhile, melt the chocolate in a bowl set over a pan of barely simmering water. 2. Using electric beaters, cream the butter and 100g sugar in a bowl for 5 minutes, until pale and fluffy. Beat in the egg yolks one at a time, then the melted chocolate and salt. Fold through the ground hazelnuts. 3. Reduce the oven to 160˚C, gas mark 2. In a separate bowl, whisk the egg whites to stiff peaks. Whisk in the remaining 50g sugar until stiff and glossy. Stir 1/3 the egg white into the chocolate mixture to loosen, then carefully fold in the remaining egg white, a third at a time, trying to retain as much air as possible. Carefully tip into the tin, gently smooth the top and bake for 50-55 minutes until just set. 4. Cool in the tin for 20 minutes, then remove the sides (leave the base on) and cool completely on a wire rack. 5. Slice and serve, with hot chocolate sauce and Chantilly cream, if liked.